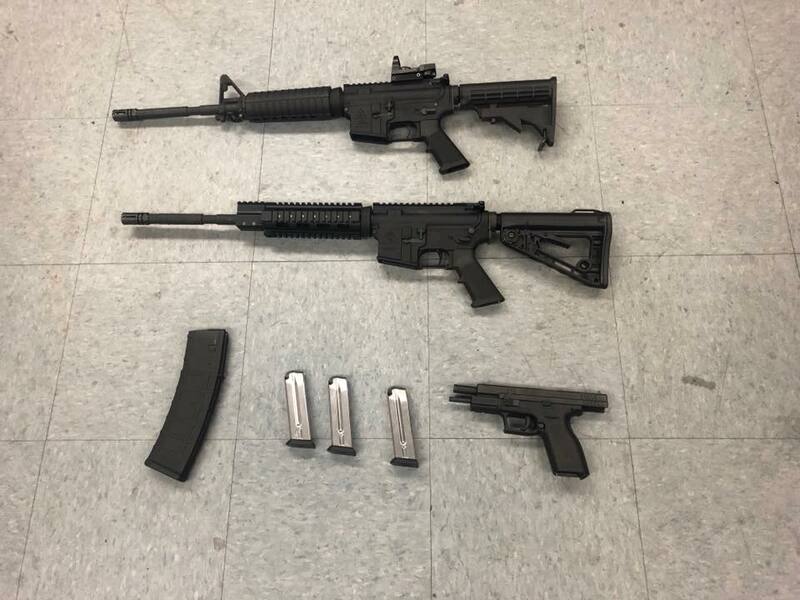 At least three schools and a preschool in Saugus were placed on “soft lockdown” Tuesday morning after deputies checking on a parolee in the area reported that a man fled from them armed with a gun. When deputies spotted a man — reportedly armed with a firearm — run from them, they went after him. “He’s still at large,” Sgt. Andy Dahring of the Santa Clarita Valley Sheriff’s Station said at the end of the day, noting: “He’s not the guy they wanted” meaning he was not the parolee they were checking on. The incident prompted lockdowns of schools around the area and a two-hour manhunt that led deputies through the backyards of Saugus homes. Arroyo Seco Junior High School and Santa Clarita Elementary School were put under the lockdown, keeping students inside the schools as a precaution. “It’s a precaution since they are near the area of the search,” Shirley Miller, spokeswoman for the SCV Sheriff’s Station, said early in the incident. A third Saugus school, James Foster Elementary School, was also reported to be in lockdown, according to a mother with three children at the school who was told to stay in her car. The Primetime Preschool at Santa Clarita Park was also placed on lockdown. Deputies with the SCV Sheriff’s Station set up a containment perimeter in the area of the parolee, Miller said. The containment area that was searched is bounded by the streets Santa Clarita Road, Guadilamar Drive and Seco Canyon Road. Containment of the perimeter proved frustrating for homeowners wanting access to their homes and for parents bound for the schools. “It’s terrifying,” said Shannon Kaehny on her way to pick up her 7-year-old son from Santa Clarita Elementary School when she was stopped by a deputy blocking all traffic on Decoro Drive, just east of Seco Canyon Road. Her son was one of several students kept inside the school as a precaution while deputies combed the nearby neighborhood. Inside the police perimeter maintained by deputies brandishing long-barreled firearms was the home of Kaehny’s parents. “That’s my mom,” she said, pointing across the sheriff’s car blocking the street to a woman walking down her driveway. A rifle-toting deputy walked up to her, and pointed at the woman’s home, at which point, the woman ran back inside her home. Despite the lockdown at nearby schools, women could be seen leaving Santa Clarita Elementary with children. Residents asking permission to enter the perimeter were told it was for their own safety not to enter since a specially trained police dog had been brought in to try to ferret out the suspect. Heavily armed members of the Los Angeles County Sheriff’s Department’s Parole Compliance Team responded to SCV from East L.A. when they learned their team members reported a “runner” during a parolee check. At 1:35 p.m., deputies and the parole team members broke down the perimeter, allowing parents to get to the schools and residents to go to their homes.